Tony the Tiger is the advertising cartoon mascot for Kellogg's Frosted Flakes (also known as Frosties) breakfast cereal, appearing on its packaging and advertising. More recently, Tony has also become the mascot for Tony's Cinnamon Krunchers and Tiger Power. 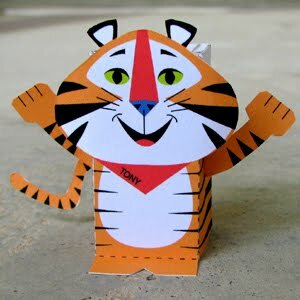 Download the PDF file here and make your own Tony the Tiger toy! Awesome, really like the Domo submission as well!